In order to start preschool or childcare, all 3 steps must be completed before the child's first day. The purpose of this brief form is to gather basic information. It can be found under the "Apply Now" tab on our website. Once submitted, you may be contacted by the Director to answer any questions and to schedule a tour of the center. If you are a returning family, this form is still required and informs us of your needs for the following year. This is the official Enrollment Form. The link will be emailed to you following acceptance into the program. Most of our former hard copy forms required by DHS have been combined into one continuous questionnaire. This step includes collection of the enrollment fee via PayPal. The enrollment fee is non-refundable and covers cost of office work, an AGC t-shirt (if in summer care), and costs associated with soap, tissues, cups, napkins, crafts, etc...There are several ways the fee can be paid. If you are a new family, you may write a check to All God's Children or funds may be deducted from your account using the required EFT form. If you are a returning family, fees can be withdrawn from the family's account. There are a few hard copy forms that are needed. 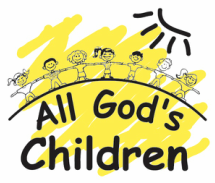 All information submitted will remain confidential and will be shared with AGC staff as required to meet the needs of the child. Please turn in all forms that pertain to your family's needs. The following forms are for children with a food allergy, siezures, who may need staff to administer medication, or request for child's diet to modified.